Location ( From The Green Zhurga ): 3.5 Km, about 7 minutes drive. 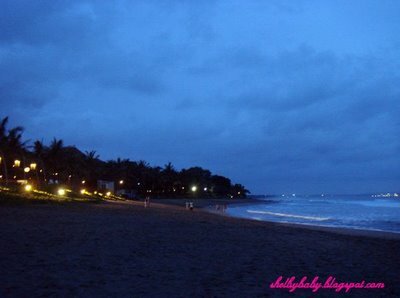 The main reason I chose to stay where I stayed in Bali was to be in close proximity to the Petitenget beach. The Petitenget sunset is said to be the most beautiful in Bali. Unfortunately for me most of my evenings are weighed down by showers so I had not managed to view this supposedly remarkable phenomena. That was ’till my last evening… I was chillin’ in the villa enjoying a good ole glass when the showers suddenly stopped at exactly 18:00 and the sky cleared up. Well it was as they said. Even post-rain it was still delightful and surreal. Petitenget is one of the few black sand beaches in Bali. Sitting there on the sand surrounded by such awesomeness, watching people and their dogs catching the waves at the shore, lovers taking a romantic stroll (oh wait isn’t that the same Singaporean couple? They came ‘ere too huh..) and literally just breathing the salty air made me realize I am very lucky to have experienced such splendour. I am so blessed *tear*. As I turned to go home I saw a place that looked so inviting.. almost fairyland-like. I decided to have dinner there. Turns out this was the very famous, very special La Lucciola that people rave about. It doesn’t have a sign so only those in the know knows it. If you’re interested, venture just a pinch beyond the temple on Petitenget beach. It flanks the holy house. I walked in with my fuschia very short Stella McCartney for Adidas running shorts + Victoria Secret ‘University of Pink’ top and Havaianas slippers only to be overwhelmed by very rich couples and pax of 4s in fine dining threads. Oops. Afew old tante-s stared at me and I gave them an “Up yours!” smile. So I’m in shorts and a vulgarly fluoro pink top IN slippers with my greasy hair pulled back in a ponytail. So? Does it say in the darn restaurant regulations you gotta be in your Sunday best to eat there? No. FYI My Speedy is as Vuitton as yours so up yours! I didn’t have a reservation (full house.. whoa) so they ushered me to the bar AFTER yet another ‘Table for 1’ banter. This is the Frangipani Lounge and I had a lime + tangerine granita. A bunch of ladies sent me a drink ‘cos they admired the fact I came dining alone. Weee! The real Shelbulosity is getting a really nice table on the upper floor (it’s a 2-storey open complex) overlooking the shore which I did. Glee! 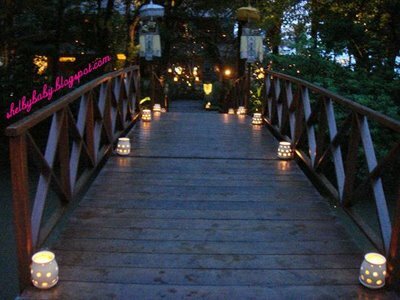 It’s just an out-of-this-world experience to have a comfortable meal in the darkness of the night luminated slightly by fairy lights and candles as we catch the waves hitting the shore. So simple yet so brilliant. We can so DIY it too. That foamy white line on the right are waves! 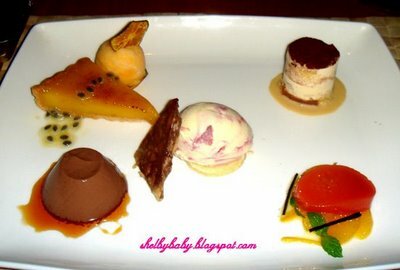 I do suggest if you’re on a budget but would still like to experience La Lucciola, order the dessert tasting platter only. It’s approximately Rm35-40 and you get to experiment with their entire range of sweet stuff. I went on to have cheap nasi goreng after that. 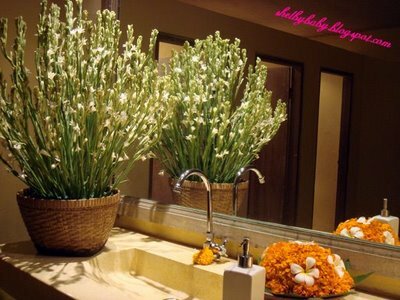 The toilet is so exquisite. It doesn’t even feel like a toilet. I’m not a big fan of jasmines but those are nice. My second last pending Bali post for now. Selamat malam. << Back to Nearby Places list. Copyright © 2019 The Green Zhurga Suites | Your place to stay in Seminyak, Bali | Seminyak Apartment Bali | A member of THE GREEN ZHURGA Collection.